The summer has flown by and as a result I have hardly had a moment to sit down to write about what I have been upto. I can't decide if I have just been too busy or I have just avoided spending time on my computer. Mostly because the weather has been great and I have been outside most of the time. Probably a combination of the two. But, now as I am back in Scotland, I finally have a chance to sit down and catch up from where I left off. I hope I can remember what happened 3 months ago let alone remember all the clients names! After my last post climbing with Jack, I was engrossed in my Summer Alpine Training run by two BMG IFMGA guides (Andy Teasdale and Neil Johnson) teaching everything they knew about becoming an alpine guide. The week's course was essentially the gateway to working in the alps because as soon as we finished, I was straight into work. My first week of work was for ISM. 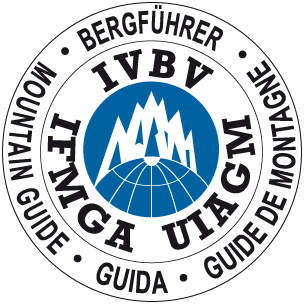 A long standing alpine guiding company who run's courses throughout the summer and winter. The course was an introductory course to 4000m peaks. Myself and Andy Teasdale guided and taught the group for 6 days with the finale being that they led themselves up a 4000m peak. We packed in training and skills throughout the week and it all came together as all teams executed the Weissmies is fine weather. A top week to start my alpine guiding career! With a few days off, I firstly teamed up with another guide and we guided our clients over the brilliant Cosmiques Arête from the Aiguille du Midi. For some reason the Scottish weather turned up for a day so we had a bit of a battle but made a smooth ascent and down in time for a nice lunch in Chamonix. After this I had a few days of with Lou who flew out to visit. A spot of mountain biking, climbing and flying filled our days which left me well rested for the next block of work. After this I had a spot of time to play with which involved escaping the mountains (weather was poor) and I headed to Italy with Swaily and Rudders for some crack climbing, another summer highlight. What a place. Like a mini Yosemite. Endless amounts of granite cracks and we were only there for 3 days. I was broken by the end of it. Fortunately a quick flight back to a wedding in Scotland enabled a good rest before I flew back out with Lou for another week of crack climbing, yet another summer highlight. I could certainly get use to this way of life! But, all good things have to come to an end. I was back to work. Fortunately, I love work and I was keen to get stuck in. This week I was working for Frost Guiding with 5 other guides of whom I know very well. So a super social week with a group of 20 school kids. A great week introducing them to the Alps. Although we did not achieve everything we wanted too, they had a good experience. It was a super useful week for me as the weather was horrendous...so we were all putting our heads together trying to come up with suitable plans and I think we just about made it work. Did you hear about the landslides this summer in the Alps? It was that week. So much rain. Poor kids! The following two weeks were taken up with Martin Morans Alpine High peaks tour. This was a 'mega' trip. 5 countries and their highest peak. So Liechtenstein, Germany, Austria, Slovenia and Switzerland. Martin has done a great write up, far better than I could do so here is the link to his words. It was a total success, we summited all peaks by our planned routes, all peaks I have never been on before. So all was left was a trip up Mont Blanc. What a great way to finish the season...the highest peak of them all (well in the Alps anyway). So this time working for Stu MacDonald, we had a team of 3 and set off on our 3 day conquest onto 'The Blanc'. Day one faultless...we arrived at the Tete Rouse hut. Day two...started well but once we got too 4200m the weather turned biblical. High winds, zero vis and bitterly cold. We concurred that this was not the place to be teetering up and down ridges so we decided to call it a day and save it for another time. A great effort by the whole team and it's great to have a good team who understands the importance of turning back while its still safe too. We salvaged our final day with some brilliant Via Ferrata in the valley. Mont Blanc wasnt quite the end. I had one final week working for ISM in Switzerland. The Saas 4000's. Working with Paolo, an Italian guide we explored the high peaks around Saas Fee with our team of 6. Due to a wide spread of fitness abilities, not everyone summited every peak we planned to do but we had a good trip nonetheless. Finishing on the Nadelhorn was a good finale for most of the team. So after my first summer in the Alps, I am happy to report that I wont be giving up guiding. It has been a great journey so far and I have barely touched the surface in the Alps. Next summer I will be out guiding again and hopefully on lots of different objectives.